Cartoon: I Have Been Silenced! If you like these cartoons, you can help me make more by supporting my Patreon! I’m trying to build a living on $1 pledges from a lot of readers, and it’s slowly working. This cartoon has four panels, plus a small “kicker” panel beneath the bottom of the cartoon. GLASSES: We’re dropping your column. Many readers think you’re just too extreme. BLACKBEARD: I have been silenced! Blackbeard is standing on stage behind a lectern, holding a hand high in the air as he declames. There’s a huge audience listening to him. We are looking at a flatscreen TV. The TV shows Blackbeard appearing on Fox News. Blackbeard is yelling. An off-camera interviewer speaks. Barry the cartoonist is talking to Blackbeard. 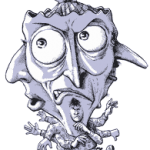 10 Responses to Cartoon: I Have Been Silenced! I guess I haven’t been keeping up. Does this refer to anyone in particular? 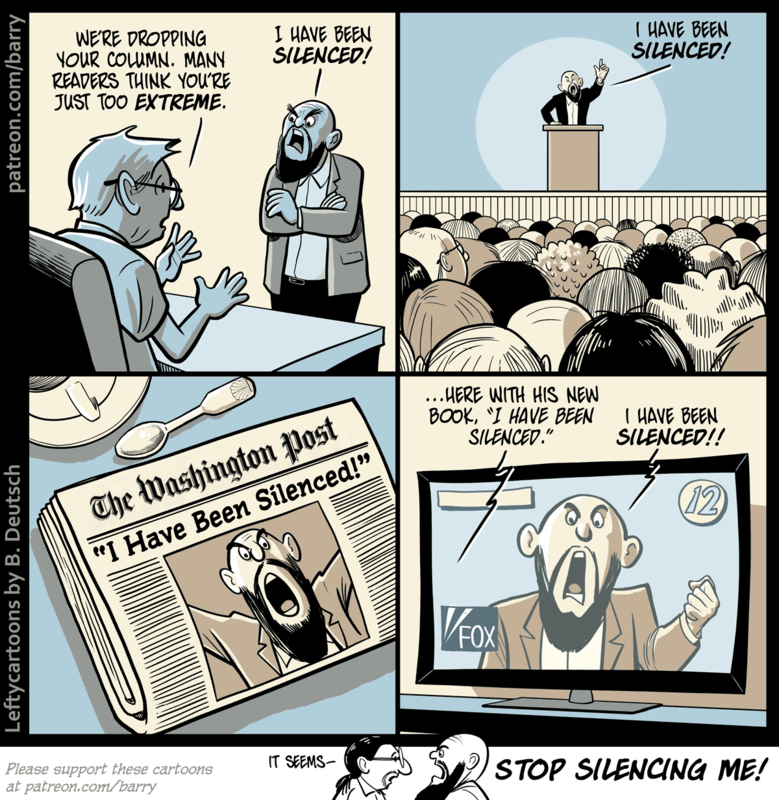 The good thing about this cartoon is it applies to many speakers, but that guy looks like Kevin Williamson. Sounds like the latest entry to the “I have been silenced!” list would be John Brennan. Did that lousy human being, John Brennan, claim he was being silenced? I thought he claimed he was being punished for his criticisms. The sad thing is, he has so much that is a lot more worth being punished for. And there’s various allegations of this being a 1st Amendment rights violation. All of which are pure bull$h!t. As has been noted here many times when people who have voiced conservative viewpoints have had negative outcomes, free speech does not mean free of consequences. Brennan’s point isn’t what you think it is, RonF. He’s not saying he’s being silenced. He’s saying that the revocation of his clearance is meant to serve as an example in order to silence others; namely, those currently working in jobs that require clearance. “If I whistleblow, I will lose the credential that allows me to do my job” is a very real threat of silencing. I don’t see how that argument makes sense. Any observant person already knows how badly whistleblowers are treated by looking at what happens to actual whistleblowers. There is no need to look at an imperfect proxy. Also note that Obama treated whistleblowers very badly, so this is not something specific to Trump. A warning shot fired over the heads of people with clearances doesn’t need to make sense to you in order to be effective. The degree of deviation from the norm, as illustrated by Brennan as a example case, is clear to the people it needs to be clear to. I wonder if you aren’t understanding that being able to maintain a security clearance is vital for a bunch of people’s jobs, even if they don’t work for the government. So revoking a clearance based on political disagreements is a dangerous attack on some people’s ability to work because it means “if you act politically in ways I disagree with I can attack your ability to work”. In Brennan’s specific case he will be fine. But it is a warning to tens of thousands of other people who aren’t as well situated. It is a warning of willingness to misuse systemic power to attack politics the President doesn’t like.